Rehydrate severely dry skin with this Balm to Oil. Made with highly-moisturizing food-grade shea and cocoa butters, beeswax, and coconut oils that nourish. Available in five fragrances plus unscented. Balm to Oil is a flameless massage oil similar to our spa candle without the wick. 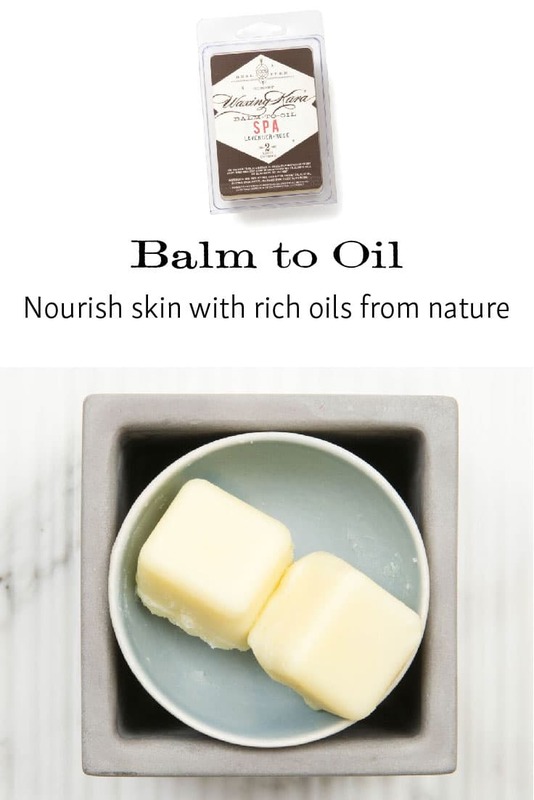 Balm to Oil was designed for extremely dry skin. A highly nourishing combination of plant oils brings vitamins, antioxidants, and lipids to the skin to fight signs of aging. With regular use, expect lasting improvement in the texture and radiance of your skin. Balm to Oil was designed to melt at body temperature. Remove a cube from the container and apply directly on skin, or use a wax melter to create a warm body oil. Both methods of use provide a rich moisturizing oil for dry skin areas like heels, elbows and hands. Apply after a bath to lock moisture into your skin for the longest lasting results. Available in five fragrances plus unscented. Balm to Oil is for both men and women. Spa: The scents of rose + lavender leaves you with delightfully perfumed perfectly soft skin. Relaxing, warm, and gracefully feminine. 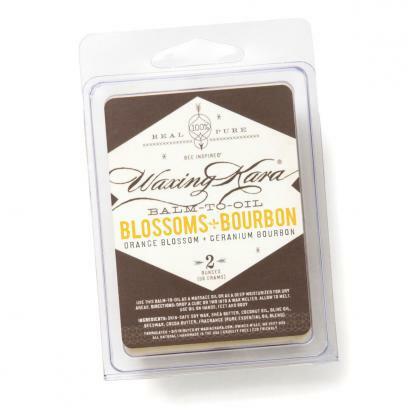 Blossoms+Bourbon: Give yourself a glow with the lightly refreshing scents of citrus and geranium. Strength: A powerfully earthy and androgynous fragrance featuring citrus, clove, and cinnamon oils. A great pick-me-up for tired skin. Peace of Mind: Lavender flowers and citrus oil combine to make a relaxing experience that soothes body and soul. Chesterhaven: Created by a master perfumer, the fragrance of Chesterhaven highlights the wildflowers that grow at our Eastern Shore apiary. Reminiscent of a breezy summer evening, the fragrance is lightly floral, a little sweet and feminine. Unscented: Pure moisture without a fragrance. Perfect for when you want to customize your own fragrance. Directions: Drop a cube or two of our Balm to Oil into a wax melter, allow to melt, and use oil on hands, feet and body as needed. Weight: 2+ ounces Measures 3″ x 4″.